Driving is the main mode of transportation for many families. Whether you’re driving your children to school or afterschool activities or you have a new teen driver at home, in all likelihood, you probably find yourself in the car driving with your child(ren) at many points during your day-to-day life. If so, this driving safety guide is for you. What to do after a car accident to protect your child(ren), as well as yourself. These insights can help you take the right steps to maximize your child’s safety on the roads, regardless of your child’s age and whether your child is riding in, driving or sharing the roads with motor vehicles. Motor vehicle accidents – including car crashes, bike accidents and pedestrian accidents – are the number one cause of death among babies, young children and teens (i.e., those 0 to 19 years old). Every day in the U.S., car accidents kill 1 to 2 children (under 13) and injure nearly 340 others. Annually, this means that auto crashes kill more than 600 children and injure well over 121,000 others. Every year in the U.S., about 35% of the children (under 13) who are killed in car accidents are unrestrained at the time of the crash (i.e., not in a car seat or wearing a seatbelt). These unrestrained deaths (involving children) tend to occur more often in wrecks involving SUVs and pick-up trucks (as opposed to crashes involving sedans and smaller passenger vehicles). In other words, it’s far more likely that kids riding in SUVs and pickup trucks are not properly secured in child car seats or with seatbelts (when compared to children riding in smaller vehicles). Unrestrained fatalities also vary significantly by ethnicity. In fact, each year, close to 50% of African American and Hispanic children who are killed in car crashes are not buckled up or properly secured in child car seats (as compared to 26% of car accident deaths among Caucasian children). 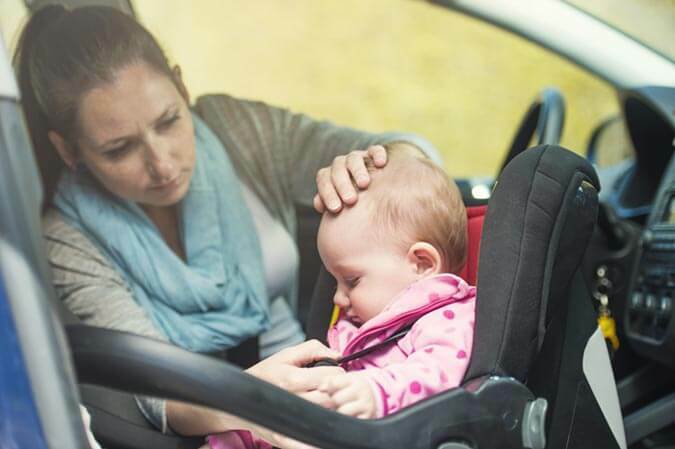 These facts underscore just how vulnerable child passengers can be – and just how vital it is that parents take the appropriate safety measures every time they drive (and especially when they’re driving with children). Child car seats save at least 260 lives every year, authorities at the NHTSA estimate. To make sure that you’re using your child’s car seat properly – and that it’ll be effective at protecting your child(ren) if an accident occurs, check out the following chart, which explains the proper placement of child car seats (according to safety officials at the CDC & NHTSA). 5 yrs+ Booster seat A child will no longer need a booster seat when a seatbelt fits properly, which will usually be when a child is at least 57” (or 4’9”) tall. Here, it’s also important mention that, of course, child car seat laws vary by state. If you aren’t familiar with your state’s laws regarding child car seat requirements (or if you’ll be traveling to another state in the near future), check out this helpful state-by-state child restraint guide, put together by the Governor’s Highway Safety Association (GHSA). It includes information about child car seat laws for every state in the U.S., along with details about the maximum penalties for violating these laws in each state. Doing some research before you make a purchase: The NHTSA rates the safety of various types of child car seats (and you see a full list of current ratings, ranging from 1 to 5 stars, here). Testing child car seats out in your vehicle before purchasing them: Try to fit different varieties of seats in your vehicle to figure out which one fits best and will be the most secure. Sending in the product registration card or completing the registration process online as soon as possible after purchasing a child car seat. Registering your child car seat online with the NHTSA (which you can do here). This will allow federal officials to directly contact you if or when a recall for your child car seat is issued. Updating the registration information if your address or other contact information changes. Carefully following the manufacturer’s instructions for fitting the child car seat into the vehicle. Possibly having an expert (like a transportation safety professional) assist in or double check the fit/placement/securement of the child car seat. 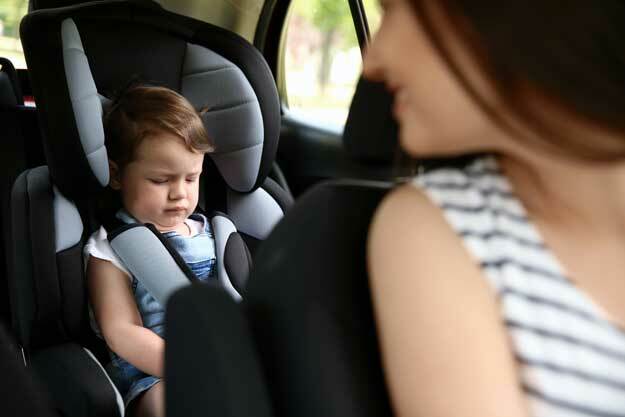 The NHTSA has a free tool that allows parents to search for local child car seat inspection stations (by state and zip code) to make it as easy as possible for parents to get the assistance they need with child car seats. Following the manufacturer’s instructions for securing a child in the car seat. Making sure the straps are properly adjusted as the child grows and the orientation of the seat is changed. Booster seats, the final transition out of the child car seat, can elevate children enough so that, if a car crash happens, they aren’t slipping out from under the seatbelt (or being catapulted over the top of it). Not using boosters can, again, put children at unnecessary risk of serious injuries if a collision should occur.Avoid this mistake by making sure children who’ve outgrown front-facing car seats ride in boosters until they are at least 4’9” (or 57”) tall (regardless of age). Responding to any recall affecting your child car seat ASAP. Being proactive and checking for recalls (rather than waiting to be notified about them) using this NHTSA tool. Speeding – Speeding is a factor in nearly 1 out of every 3 deadly car accidents involving a teen driver. So, encourage teen drivers to always obey the speed limits and to take it much slower whenever poor road or weather conditions arise. Distracted driving – Distracted teen drivers kill more than 300 people (sometimes including themselves) every year in the U.S.So, make sure your teen is committed to focusing on the road whenever (s)he gets behind the wheel. If texting or cellphone use while driving is a problem or concern, consider getting an app that prevents your teen from being able to use a cellphone while driving (there are various options currently on the market). Drunk driving – Although every state in the U.S. has Zero Tolerance laws (prohibiting teens from driving with any alcohol in their systems), deadly car crashes involving drunk teen drivers end up killing at least 600 people in the U.S. every year.So, be sure that your teen is aware of just how dangerous and deadly drunk driving is – and that there are many options for getting safe, sober rides home when necessary (like by calling you for a ride, getting a taxi, using public transportation or a ride sharing service, etc.). Wearing seatbelts – Nearly 60% of teens who are killed in fatal auto crashes every year are not buckled up when the collision occurs. This is incredibly tragic because, when auto accidents happen, the simple act of wearing a seatbelt can cut the risk of suffering serious (and life-threatening) injuries in half.So, make sure your teen always buckles up – anytime (s)he’s driving or riding in a motor vehicle. Wearing a seatbelt can make the difference between life and death when car accidents happen. Driving with teen passengers – When teen motorists drive around with teen passengers in their vehicles, their risk of a crash can increase exponentially. This is partly due to the fact that teen passengers can be a source of distraction for teen drivers. It also stems from the fact that, when other teens are in a vehicle, teen drivers may be more likely to speed, violate traffic laws and try to “show off” for their passengers.So, consider limiting when (and whether) your teen driver can give rides to other teens. It may even be wise to make sure at least one adult is in the vehicle if a teen will be driving around other teens. Teach children to never just run into the road – Instead, show them how to look for and obey traffic lights/signals/signs and to properly check for oncoming vehicles before they ever step into the street (i.e., to look right, left, then right again). Make sure children always wear a safety helmet (and other safety gear) when riding bicycles – Also, make sure children know where they can safely ride versus where they should not ride. And be sure to tell them to stop and double check before riding across driveways, alleys and intersections, where cars may pull out or around corners suddenly. Have children wear reflective gear and bright colors if they are walking or riding in low-visibility conditions – For instance, if kids will be out at dusk or when it may be cloudy or foggy out, be sure they are wearing reflectors and bright colors (and possibly carrying a flashlight) so they are as visible as possible to any motorist on the road. Be a good role model for your children – Make sure you comply with all traffic laws, wear the proper safety gear and generally set a good example for your children to follow when it comes to driving, riding and pedestrian safety. Move out of the way of traffic as soon as possible. Once you and your children are out of harm’s way, call 911 ASAP. Police can clear the wreckage, investigate the crash, and make sure emergency responders arrive at the scene to help you and your children. Make sure you and your children are checked out by a doctor Even if no one seems to be seriously injured, getting immediate medical attention is crucial to receiving the right treatment(s) and preventing further (possibly more serious) injuries. Collect information from other drivers and take pictures of the damage caused by the collision. This information (and evidence) can help establish fault, which can be central to obtaining compensation for the losses and expenses caused by the wreck. If, however, you can’t take this step after a crash (because of serious injuries, for instance), please be aware that it may be documented in the police report for the car accident (and that you can obtain a copy of this police report from the responding agency). Report the crash to your insurance company as soon as your and your children’s health is no longer in danger. When you make this report, only disclose the facts of the crash. Do not admit fault, and don’t answer any questions that seem to bait you into accepting blame for the crash. Meet with a car accident lawyer to find out more about your options for financial recovery. A Denver injury attorney can help you determine who’s liable for your crash and what you can do to obtain compensation for your (and your children’s) crash-related medical bills, as well as for vehicle repair costs, lost wages, pain and suffering. Because initial consultations are usually free, you have nothing to lose when it’s time to learn more about your rights, options and possible case following a car accident. There are many things that parents can do to protect their children whenever they’re in cars, riding bikes or traveling as pedestrians. Older children can also take some responsible and certain measures to protect themselves and stay safe on the roads. 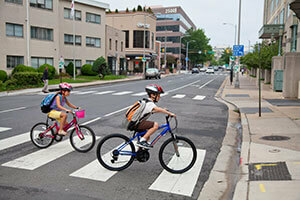 The safety precautions you and your kids take every time you hit the road can prevent serious injuries and save lives.